The first run of our 2019 Calendar has an extra BONUS page! Each calendar is made up of 13 pages — 12 months and a cover. Each page is carefully hand printed by the ffrench Family of Stockbridge, MA. We get a little help from our friends (we bow down to our print team). Each image is designed by a family member. Artists include Crispina ffrench, her son Ben Paley, daughters Lucy and Violet, Sofia Hughes and her daughters Lily and Jamie. 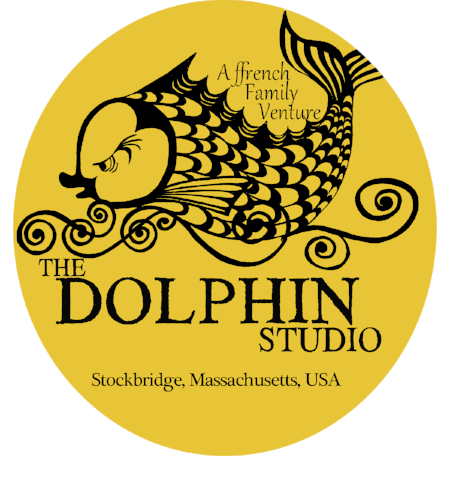 In addition, vintage prints designed and first executed by John and Primm ffrench (our parents and founders of The Dolphin Studio) are added to the mix. We use water based inks on recycled paper in an effort to make our process as environmentally friendly as possible. Our calendar was featured in Martha Stewart Living in 2017 and is in the current issue of DIY magazine!